BAGHDAD - His Excellency Dr. Ibrahim Al-Jaafari, Minister of Foreign Affairs, received in his office HE Dr. Talal Abu-Ghazaleh accompanied by HE Dr. Jawad Al Anani and twenty directors representing various activities at Talal Abu-Ghazaleh Organization (TAG-Org) during Dr. Abu-Ghazaleh’s official visit to the Republic of Iraq. The two parties discussed, in the presence of Iraqi Ambassador to Jordan HE Ms. Safia Al-Souhail, the importance of cooperation and joint coordination in the best interests of both countries, as well as strategic Jordanian-Iraqi relations, underlining the need to exchange views on bilateral relations and issues of mutual concern. 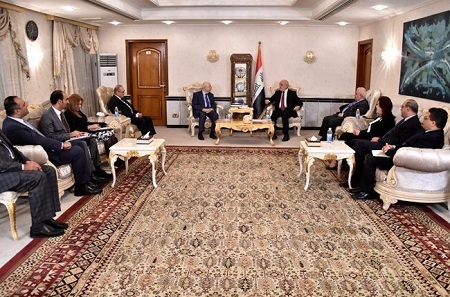 Dr. Abu-Ghazaleh affirmed that the most important component in political decision making is the economy; referring to the essential economic and political role of embassies and ambassadors in enhancing ties between countries and underscoring the need to attract international Iraqi expertise and promote national investments. 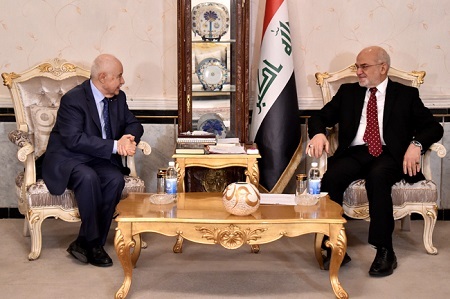 Moreover, Dr. Abu-Ghazaleh called for enhancing Jordanian-Iraqi relations at an institutional level by proposing the establishment of an Iraqi-Jordanian cooperation council for the private sector. He also underlined the importance of a specialized economic media referring to the potential for broadcasting programs from the Talal Abu-Ghazaleh Business and Culture Radio Station in Iraq in coordination with the Iraqi Media Network in a mechanism that serves Iraq and its people. Meanwhile, Dr. Abu-Ghazaleh delivered a lecture at the Foreign Service Institute entitled “Knowledge Society” during which he tackled the importance of science and knowledge in building societies and stressed the importance of transformation of modern societies into knowledge-based communities that are capable of producing knowledge and wealth able to lead nations.